Training the next generation of leaders is crucial to spreading the gospel, yet most churches have no formal way of doing this. Why? Tight budgets, small staffs, and a lack of know-how are just a few reasons suggested by church consultants Aubrey Malphurs and William Mancini in this groundbreaking book. 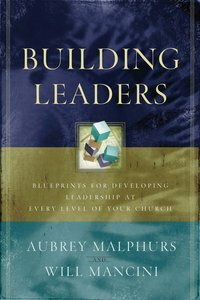 Packed with surveys, discussion questions, and a leadership development guide, Building Leaders will encourage leaders to "duplicate themselves" in order to see their ministry grow. It is a perfect resource for ministry students, church leaders, and pastors. Aubrey Malphurs (Ph.D., Dallas Theological Seminary) is president of Vision Ministries International and chairman of the Field Education Department at Dallas Theological Seminary. He has served as a pastor and church planter and is the author of numerous books in the areas of leadership, vision, and church ministry, including Ministry Nuts and Bolts: What They Don't Teach Pastors in Seminary; Doing Church; and Developing a Dynamic Mission for Your Ministry. Will Mancini, a former pastor, is the founder of Auxano, a national consulting group that works with traditional and emerging churches and ministries of all types around the country. Their mission is to navigate leaders through growth challenges with vision clarity (auxano.com). ýAbout Leadership Network The mission of Leadership Network identifies and connects innovative church leaders, providing them with resources in the form of new ideas, people, and tools. Contact Leadership Network at www.leadnet.org.